Very good headphones. I reccomand for all people really. an excellent headphones. Had a good listen to these Sennheiser HD215 comparing them with Shure SRH440. I found the construction of these giants not as impressive as the Shures. The bass is not as heavy as some other Sennheisers at this price point which is good. Having been a sound engineer for sometime, I am not sure if the rotating can is a good idea or really required. My personal thinking is that I don't want any more moving parts than it really need lest they create crackling noise and is just another part that can break. Pretty sure they have 40mm drivers so I don't really understand why they are so big. 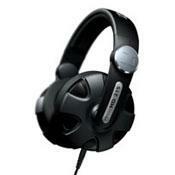 They felt loose on my head and did not have the same level of isolation the SRH440 has. The sound is polite with nice bass if that is what you are after. the headphone lead can detatch from the headphones, which means it is easily replaced if damaged. they are reasonably cheap and well worth what i paid. only the right ear cup swivels. maybe a DJ would want the option of having either left or right. I bought these headphones a couple of months ago to use for 'around the house' listening. although they're designed with DJ's in mind, these fit my citeria perfectly. I would strongly recommend these headphones for anyone who wants good sound quality, although that being said, they don't rival the more expensive high-end headphones with sound quality.